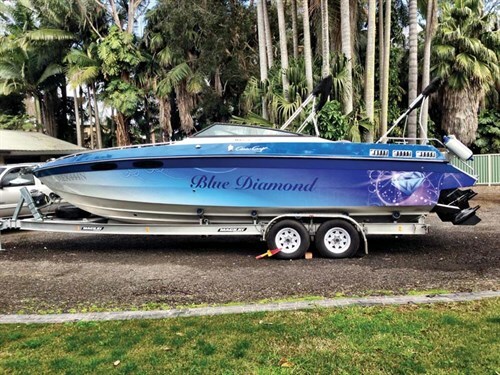 Blue Diamond on her MacKay boat trailer. The new Bravo legs underwent a few prop changes at first. The interior features a compact galley and pancake maker. Before and after. Notice anything different? 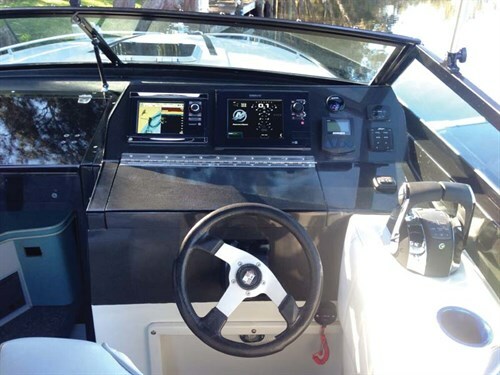 After many years of faithful service, Andrew Rouse faced a tough decision regarding his beloved 1988 Chris Craft Stinger 260. 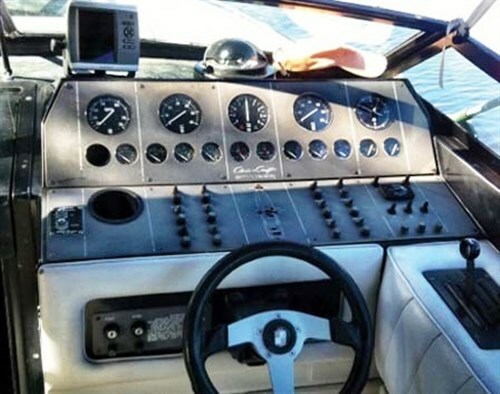 The 25-year-old engines were done in after 1500 hours and the iconic sportsboat was looking a bit tired. Time for a new boat? After crunching the numbers, Andrew discovered he’d be unable to get anything similar for the same price as a new pair of engines, so family favourite Blue Diamond won herself a makeover. Originally bought in Victoria, Andrew purchased his Chris Craft in 2000 and these are the same memorable boats used in ‘80s TV show Miami Vice, along with Scarab speedboats. First on the refit list was replacement engines and after seeing the reliability of the original freshwater-cooled MerCruisers, a newer version seemed an obvious choice, albeit with Bravo legs this time instead of the Alphas. The process of dragging Blue Diamond into the modern era also saw a major electronics upgrade, so in went Merc’s VesselView and Digital Throttle Control, the latter particularly impressing Andrew. "Going with DTS on the new engines has made a world of difference," he said. "It is now totally precise and since there are no moving cables, nothing to stretch or break." The old dash with one million switches and gauges. New carbon dash and all the marine electronics fruit, some of which had never been linked together before. Down through the hatch, Andrew replaced the ageing upholstery with brighter colours and plush cushions, as his family often overnights on the big Stinger, so there’s also a hot water shower, oven, electric grill, fridge, 12V outlets and even a dedicated pancake maker, plus Bluetooth Fusion stereo and underwater lights to keep the kids amused. But how does she ride? After trying no less than five different propellers. Andrew settled on a four-bladed Rev 4 which provides a bit of stern lift to heavier hulls while maintaining total control. Moving the batteries and rebuilding the waterlogged swimplatform had also changed the Chris Craft’s weight distribution, but sea trials proved everything worked just right, and the new engine management systems confirmed this at the helm. 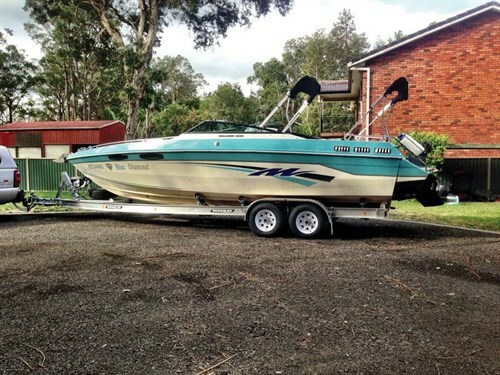 Now, the Rouse family have a glorious looking ‘80s speedster for watersports and holiday fun. And after all that hard work (and internet research) by Andrew, his dedication and commitment have produced a boat that should still be around in another 25 years. 1. Prepare to be the project manager for the job. If you don’t have the time, find one. 2. Try to be patient and don’t push people too hard – rush jobs never work. 3. Make Google your friend – if somebody says something is not available or not possible, jump on the internet. 4. Research systems like NMEA or CZone for any marine electronics work to avoid being locked into one brand (also allows your devices to connect). 5. Take lots of photos and if you’re using a phone, then back it up. 6. Work out how long you plan to keep the boat for. This will help you decide what you spend, what you change, and the quality of what you’re buying. See the full version of this review in Trade-A-Boat #467, July / August 2015. Why not subscribe today?